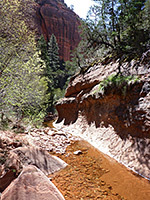 The La Verkin Creek Trail is the main hiking path in the Kolob Canyons region at the northwest corner of Zion National Park; starting at a minor high point (Lee Pass), the route heads south down the shallow valley of Timber Creek, directly beneath some of the towering red cliffs of Navajo sandstone for which this area is renowned, then crosses a wooded saddle, turns east and leads upstream along the much deeper canyon of La Verkin Creek, which always contains a sizeable amount of flowing water. 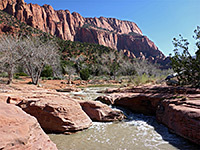 The valley sides are formed of vertical cliffs that gradually become closer together until the stream covers all of the canyon floor in places, though the valley is still relatively wide when, 6.3 miles from the start, a 0.4 mile spur path follows an overgrown, north-side tributary ravine to a viewpoint below Kolob Arch, one of the largest in the world, with a span of 287 feet. 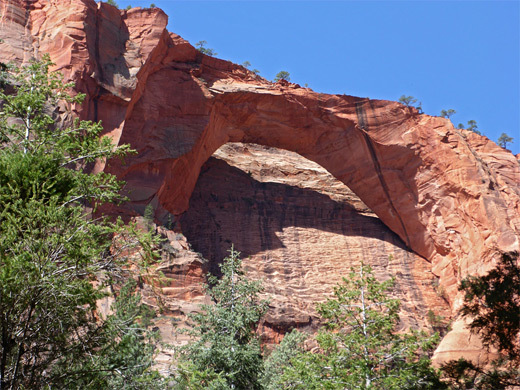 The arch is by some way the most popular destination for hikers, many of whom opt to camp for one night en route, though some proceed another 0.4 miles to a second junction, with the long and little-used Hop Valley Trail that connects with the Kolob Reservoir Road and forms part of the 47 mile Trans-Zion Trek. Hardly anyone continues beyond this junction, as the now fainter path continues through shadier and more wooded terrain, crossing the stream many times, passing the slot-like tributary of Beartrap Canyon and later leaving La Verkin Creek up another narrow drainage, Willis Creek, and finally meeting the park boundary, where a gate marks the start of private lands. An onwards trail from the boundary towards Kolob Reservoir is closed, hence through-hikes are not possible and so because of this, and the sometimes difficult terrain, and the long distance from the trailhead, the upper reaches of La Verkin Creek, past the Hop Valley junction, are rarely seen, but the first half of the trail, to the vicinity of the arch, is quite easy and always scenic, both because of the wider landscapes, of dramatic red cliffs and peaks, and for the immediate surroundings, since for most of the way the trail follows streams, often flowing over little cascades. 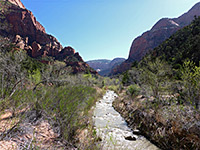 La Verkin Creek topographic map, location map for Zion National Park. 20 views along the La Verkin Creek Trail. The trailhead at Lee Pass is 3.7 miles along Kolob Canyons Road and has 18 marked spaces; some vehicles may be left here overnight, by people camping along the trail. 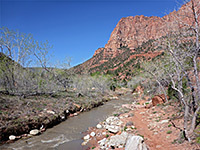 The path descends gradually along the upper end of the valley of Timber Creek (east side), initially staying a little way above the streambed, then descending to the canyon floor, crossing briefly to the west, and continuing to a junction with a tributary that joins from the east, (in wetter times) approximately doubling the flow of the stream. This point is 1.3 miles from the trailhead but only a quarter of a mile from the upper end of the scenic drive, and the trip could be shortened by starting from here; parking at the third pull-out before the main area at the end, and walking southeast down the wooded valley sides, which are neither particular steep nor too overgrown, and arriving at the stream in the vicinity of the confluence. Past here, the trail briefly climbs above the creek on a sandy bench then drops down again and crosses the small stream about six times in quick succession, in a still-shallow valley that lies in shade during the morning owing to the vertical cliffs of Shuntavi Butte that rise high above. The first of up to a dozen primitive camping areas along the trail is situated beside one of the creek crossings. Another tributary joints from the east, originating beneath Gregory Butte, soon after which the stream enters a pretty sequence of small falls, elongated cascades and clear pools, as it flows over terraces and ledges, and starts to become entrenched, bordered by low cliffs rather than earthen sides, though it soon moves out of sight, as the path starts a gentle climb, away from the valley floor. 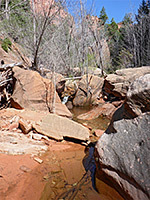 The trail reaches a broad saddle and leads steadily down through pinyon/juniper woodland the far side, while dropping by 500 feet, steep only towards the end, and emerging to flat, open land beside La Verkin Creek, leaving the trees opposite a short but powerful waterfall where the fast flowing stream pours over fluted, pinkish-red sandstone into a deep pool. Walking is now level and easy, on wide banks of grass or sand, always on the north side of the creek. 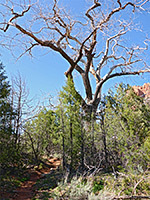 Big, isolated cottonwood trees rise above the flats, some dead, others having lost huge branches, now lying on the floor. 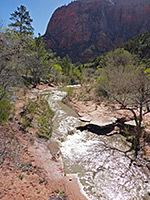 The trail generally stays right beside the stream, but in a few places rises above to pass obstacles. Camps five and six are on sandy ground, carpeted with white flowers of sand verbena in the spring. A dramatic red rock amphitheater comes into view to the south, below Neagle Ridge and Burnt Mountain. The path crosses a tiny tributary, close to camp seven, then rises a little more to pass another stream in an overgrown area, just above an algae-lined cascade down a smooth rock face - the waters originate from a spring a short distance above. 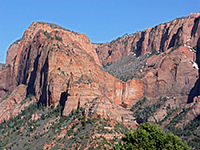 Camps eight and nine are close together, near the junction with the 0.4 mile spur to Kolob Arch. After here, the main trail continues east, staying wide and seemingly well-used, and soon encounters the first creek crossing, to the south side, near another spring, followed by a short climb to the next junction with the path to Hop Valley, 6.5 miles from the Lee Pass trailhead; this next path starts with a steep set of switchbacks, while the other route continues to Beartrap Canyon and beyond. 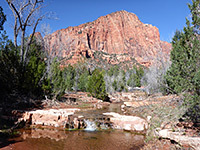 The side trail to Kolob Arch, up an overgrown ravine (unofficially known as Waterfalls Canyon, or Icebox Canyon) that usually contains a small stream, is narrow and uneven, with a lot of short climbs and descents to avoid small waterfalls, cliffs and piles of boulders. 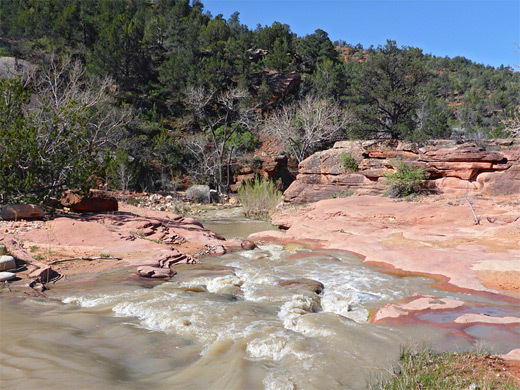 Walking directly up the streambed might be an alternative, certainly more scenic, though with some pools to pass. The last descent along the trail is to a wider area near the confluence of three forks, just beyond which the route ends in a clearing in tall pine forest, nearly 1,000 feet below the arch and 1,700 feet distant. Despite a notice advising against trying to get any closer, a rough path shows where some people have tried, climbing the steep bank opposite. The view if continuing would seem not to be significantly different, and the arch is virtually impossible to approach close up, since it is sited on the rim of a vertical cliff, on the west side of the ravine, at the edge of an isolated mesa that is encircled by more cliffs on all other sides. Because there is only one viewpoint, most photographs of the arch look very similar. Yellow barberry is about the most numerous of the limited number of wildflower species in the side canyon, though the more open drainages of Taylor Creek and La Verkin Creek have a more extensive range.